When we first spotted this bike called ‘Jerry’, we thought it looked like the latest offering from Confederate Motorcycles – the large logo on the tank told us otherwise. After some investigating we realised that it was appearing mostly on Spanish motorcycle blogs. Turns out there was a reason for this. 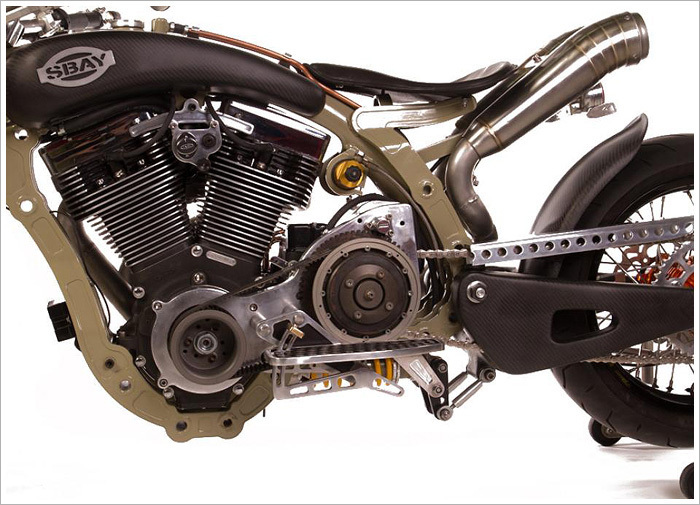 ‘Jerry’ is the creation of Spanish bike builder Sergio Bayarri. Sergio is well know for building the ‘Flyer 1800 cafe racer’ which picked up numerous custom bike building awards a few years back. He is the CEO and project engineer at Sbay Motor Company, which is based in south western Spain in a city called Cadiz. They are renowned for building bikes using V-Twin engines of American origin and it looks like they’re back with another ball tearing 1800cc rocket. Although this time they’ve made it a little more practical – if you could say that. 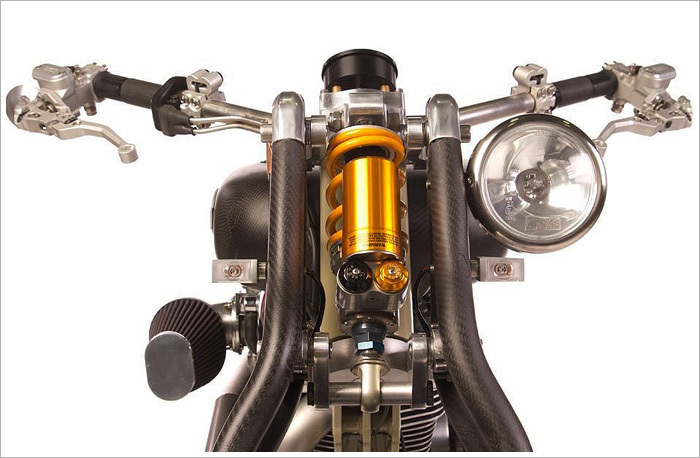 Sbay Motor’s simple philosophy is to build motorcycles that perform – and perform they do. 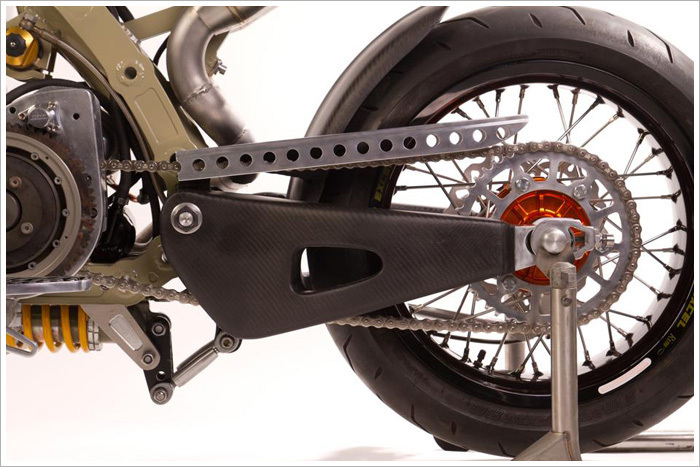 The suspension and brake configuration must be directly related to the bike’s performance. The ‘Jerry’ has front dual 300mm Galfer wave discs with Brembo 4 piston calipers and ISR brake pumps and rear 260mm Galfer wave disc with ISR 2 piston caliper and pump which are responsible for stopping this beast. Ohlins are responsible for keeping the bike on track. The stunning girder front end has Ohlins TTX with fully adjustable compression and rebound, and the rear swingarm is kept under control with an Ohlins with a satellite canister placed under the riders seat to allow for changes on the rear suspension while on the move. 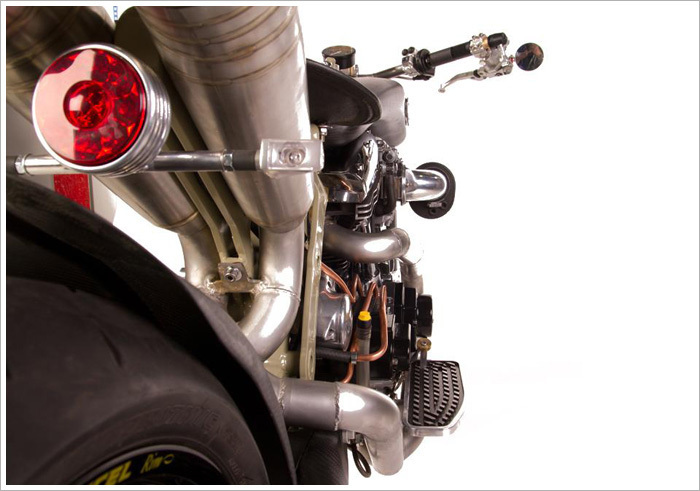 Jerry’s power is provided by a beastly RevTech 110-cubic-inch (1800cc) V-twin engine. The power to weight ratio is where this bike really shines. Through the extensive use of carbon fibre the total weight of the ‘Jerry’ is only 206 kg. Thanks to this power/weight ratio Sergio says that “Jerry’s performance is phenomenal”. Although the bike looks like it is has a very long wheel base it’s actually the same as a stock Harley-Davidson Softail. The Jerry has 17” rims to reduce centrifugal forces responsible for keeping the bike upright when entering a turn. The footrests have also been strategically positioned to allow the rider to lean at an angle of 56 degrees. The dual fuel tank which follows the line of the frame beautifully is made of carbon fibre with each side holding 5.5 litres each (that’s 11 litres in total for those of you that are bad at math). The front and rear fenders are also made out of carbon fibre by the lads at Sbay. Sergio recently purchased a new Haas CNC machining center and lathe. So they have been busy putting their new toy to work. Most of the bike has been machined in their shop, including the footpegs, handlebars, girder front end, beltdrive and chassis. 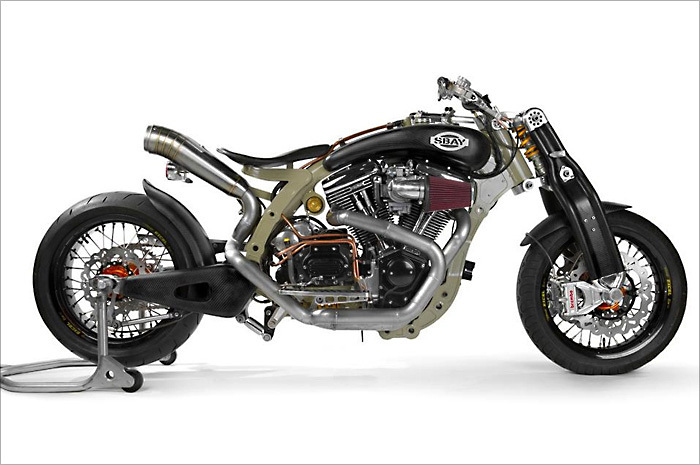 This bike is obviously not for everyone – and I’m not just talking about just the looks. All this fancy pants carbon fibre and hand made parts come at a price. 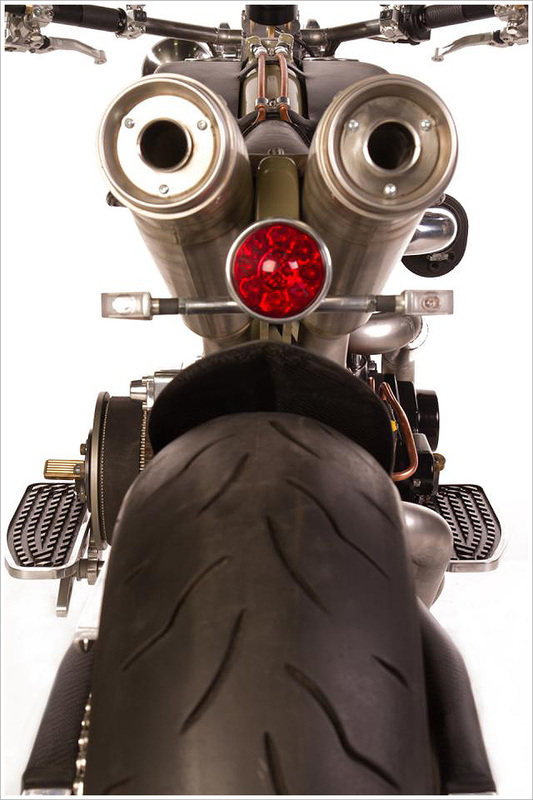 The bike will be sold for around 48,000 USD and the production run of this particular model will be limited to 50 units. Sbay have big plans for the future and are looking at starting an assembly plant in Florida where all bikes for the US market will be assembled. We’ll be interested to see if the American market embraces these Spanish bespoke amercian muscle bikes – I guess time will tell.